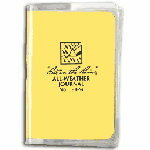 "Rite in the Rain" is a patented paper created specifically for writing field notes in all weather conditions. "Rite in the Rain" sheds water, so users can continue to write on it, even in a downpour. Featuring a Field Flex cover, secure stitching and imperial & metric rulers printed on the covers, this notebook is the new favourite among student and professionals alike. The 4 5/8" x 7" stapled notebooks are sold in Packs of three and have 48 numbered pages (24 sheets). Page patterns available: Transit, Level, Field, Metric Field, Universal, Metric Grid, Journal.